Workblades, Inc. / Warren, MI founded in 1984 by Edward Bard Sr., as a manufacturer of work rest blades for all models of centerless grinders. 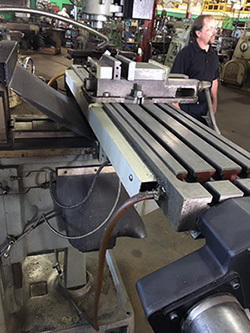 Workblades, Inc. also manufacture industrial knives for labeling machines, pelletizers, granulators, shredders, chippers, metal shearing or any cutting operation. Industries served include food processing, packaging, metal processing, recycling and solar. In 1986, Edward Bard Jr., while going to high school, started working part time for his father at Workblades, Inc. “Junior” (the name he goes by) begun to learn the nuances of this highly specialized niche market, and started full time in 1989. He now runs the company of 23 employees. According to Junior, “Our business is what can be considered a black art. All of the products we manufacture are typically made out of tool steels like D2 or DC53, or carbide like C10. These are not the easiest materials to work with. That, combined with knowledge of the part geometries required to produce the results our customers desire, took years of trial and error, in order to acquire our reputation for quality at better than competitive prices. It is an extremely hands - on craft, and the number of companies that can provide this level of expertise is limited. 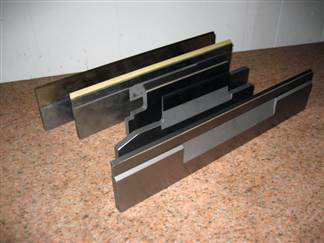 This reputation gained by Workblades, Inc. for high quality at competitive prices, has earned them, by word of mouth, customers all over the world. Even given the hands-on, craftsman nature of the work, about 5 years ago, Junior wanted to produce certain features on some of the parts they make more efficiently. By utilizing a CNC milling machine, instead of a manual milling machine (and by utilizing some un-conventional machining methods,) productivity could be improved on certain parts. In 2011, he contacted his local machinery and tooling distributor, Production Tool Supply, there in Warren, MI. The P.T.S. 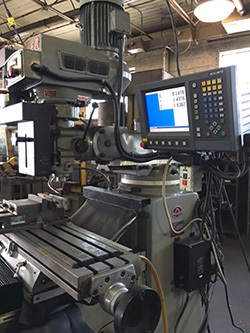 representative recommended an Acer vertical milling machine with a 10” x 50” table and MillPwr II CNC control. This machine package offered the size and flexibility to produce the part features using the non-conventional methods Junior envisioned. Workblades, Inc. was satisfied with the results that could be achieved with the Acer/MillPwr package. However, what started as an annoyance initially during the first 3 years of owning the machine, now was becoming a costly problem: the materials being machined (tool steels, carbide) all require a high volume of flood coolant to machine. The milling machine came with linear glass scales from the control manufacturer, Acu-Rite, for position feedback to the MillPwr CNC. The flood coolant was continually contaminating the X axis glass scale, causing it to fail and making the machine unusable. This created costly down time on at least 4 occasions during those first 3 years. Each time the scale had to be removed to be repaired or replaced, before the machine could be used again. Darrin Bartok, Application Technician for P.T.S., offered Workblades, Inc. a solution: Newall linear encoders for CNC feedback. The ability of Newall linear encoders to withstand dust, dirt, chips, oil and coolant (IP67 rated – fully submergible,) has made Newall world renowned in their DRO products. Newall also offers the very same reliable inductive encoder technology for most CNC, PLC and PC systems as well. By replacing the Acu-Rite glass scale with a Newall SHG-TC linear encoder, downtime due to scale contamination was eliminated. The Acer / MillPwr machine at Workblades has not experienced that issue again for over 2 years – problem solved. Junior was very grateful to P.T.S. for providing a solution to the problem, and has decided to replace any other linear scales that may fail in the shop with Newall.